The picture shows above a ceramic resistor, available as 5, 10 and 20 Watt type (WW 5. WW 10. WW20). The value is printed on the resistor; the tolerance is 5%. Wire resistors have an inductance, leading to a reduced conductivity at higher frequencies. Below, the picture shows a low inductance metal-oxide resistor, available in 3, 5 or 10 Watt ((MOX 3, MOX5 and MOX 10). The resistors are colour coded, indicating the resistance value. If required we'll explain the colour code and the representing values to you. All resistors have a tolerance of 5% (2% on request). Metal-oxide resistors are used in demanding applications, otherwise wire resistors are sufficient. 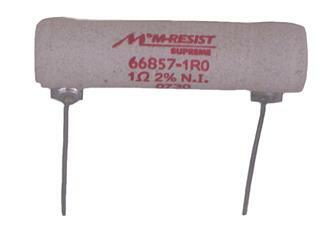 If you are looking for the best possible solution Mundorf offers M-Resist Supreme (right hand side). Precision, foil and wire resistors; they do not, however, improve further on sound quality.